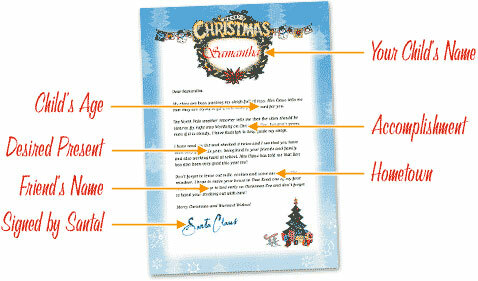 Imagine the excitement on your child's face upon receiving a Personalized Santa Letter! Santa can personalize details specific to your child including: your child's name, gender, age, hometown, accomplishment, present, and best friend's name! We have Five FREE unique Santa Letters to choose from, great if you want Santa to write to more than one child in a household! You can even choose between eight background templates! 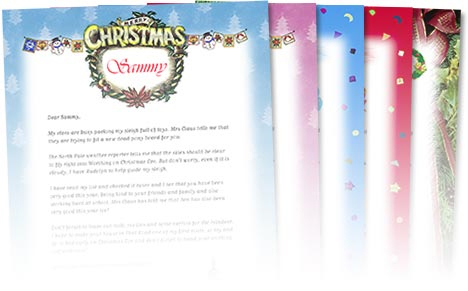 We offer a choice of a Free Printable Letter from Santa or a High Resolution Printable Letter from Santa with a personalised envelope. It couldn't be easier! Create Your Child's Free Personal Santa Letter in 2 Minutes! Our Free Letter from Santa is ordered by parents, grandparents, relatives and friends. Did you know that in 2017, Free Letters from Santa Claus sent over 800,000 Santa letters! Whose face could you light up with a letter from Santa this Christmas year? A Santa Letter is not only for children; why not send one to a grown up and put a smile on their face too! And because we offer the choice of a free printable letter from Santa or a free Santa Letter email, you're sure to bring a smile to people's faces this Christmas whether they're near or far! "My name is Michelle and I just want to tell you how great your send a letter from Santa is. I have 5 children, 3 of which are adopted and have come from a very bad situation. They have been with us for about 2 1/2 years and have all but given up on dreams and fairy tales. If you could have seen the look on their faces when they opened their emails. It was like magic!! I am not sure if they believe in the unbelievable, but I do know that after reading their letters they are well on the way." "I just wanted to drop you a line to thank you for your lovely service of letters from Santa. My daughter, now 4, is really getting into Christmas this year and I think she'll get a huge kick out of getting a letter from the big guy. I printed a postmark, along with the addresses, on an envelope and put it in the mailbox. I can't wait for her to get home from school this afternoon to find it!" "Just used your Letters to Santa website and wanted to say what a fantastic idea it is. Many Thanks on behalf of my little ones for making Christmas extra special." "Thank you for the Santa letter. My boy will love it. It's his first Christmas where he's old enough to really know what's going on." "Thanks for the free Santa Letter!!!!! My daughter will love it." "Absolutely thrilled with the personalised letter from santa for my daughter, thankyou, will be putting my friends on to your site!" "Thankyou for providing this wonderful service. What a wonderful way to keep the spirit of Christmas alive for children all over the world!!"